And what about today? What shall I say today? I find no peace; pride predominates over me more than in earlier times. I suffered much to complete even a small act of humiliation. About what happened to me yesterday I shall speak very little; I do not control my tongue and for this reason I cause other people to suffer. For obedience to my confessor I must speak very little and never with people who know about my experiences. A few days ago when Father Norberto came, I hid instantly; another time he came and I did the same; I was ready, truth be said, to be obedient, but then what happened to me? After a few days I chanced to be speaking to another friar about this and I invented a big lie, saying that it was Mrs. Cecilia who had made me hide; but that was not true, it was I who did it on my own. I don't know how Father Norberto came to learn of this, but instantly he referred the matter to Mrs. Cecilia, who was very hurt. But I was no less hurt. She interrogated me about whether I had really spoken and I answered no, because I had completely forgotten about it; but there's always the one who makes me remember everything; my guardian Angel came and re­proached me, saying: "Gemma, what's this, even lying? Don't you remem­ber a few days ago, when as punishment for telling Brother Famiano about your experiences, I made you stay half an hour ... ?" I then recalled everything well (I must say that my guardian angel, every time I do a bad thing, punishes me; not an evening passes that I do not have some punishment) and he commanded me to go to Mrs. Cecilia and tell everything and beg her in his name to forgive me. I promised to do this, sure! The day passed, then came the evening and I never made that little act of humility. My angel reminded me again, saying that if I didn't go to her and tell her everything, that night the devil would come. Well, that threat I could not ignore, and so I went to her room. She was in bed and the lamp was out; I couldn't believe it: this way she would not see me. As well as I could I told her everything, but in a forced way; it was a great shame, my being unable to humiliate myself. Finally, after she said all would be forgotten, I went to my room. Yes, of course! She said all was for­gotten but it was impossible. I asked Jesus many times for forgiveness and also my beloved Angel, and I went to bed. What a horrible night! My Angel, be­cause of the great resistance I had put up before accepting my humiliation left me alone, and with a few visits by the enemy. I could not sleep because my conscience was ill at ease; how I was troubled! In the morning my guardian Angel finally came and he reproached me harshly, very harshly and left me once again alone and afflicted. I received Communion but, my God, in what a state! Jesus did not make himself felt. When after all this I was able to be alone, then I let out my feelings freely; I was at fault, I realize that; but if I can say one thing, I did not wish to cause certain displeasures to certain persons, but my evil inclinations are so bad that I often fall into these things. For more than an hour Jesus made me stay in that state; I cried and I was afflicted. Then Jesus had pity on me and he came; He caressed me and made me promise not to do these things again, and He blessed me. I have to say that in what happened yesterday I told three lies, I had an­gry thoughts, and I had the idea of avenging myself against whoever had tattled on me, but Jesus prohibited me from speaking with Brother Famiano and with others. I quickly became calm, and to be even more so, I ran to confession. Then in the evening, after saying my prayers, I set out to do the usual Holy Hour prayer. Jesus stayed with me throughout; I was in bed*, as usual, because otherwise I would not have been able to remain with my beloved Jesus and suffer with him. 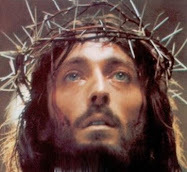 (*During this period, Gemma’s confessor Monsignor Volpi, had ordered Gemma to go to bed in the evening, and not linger in her room in prayer) I suffered a lot; He proved anew his love toward me by giving me His crown of thorns until the following day; Jesus loves me most on Friday. That evening He took back the crown, saying He was happy with me and as He caressed me He said: "Daughter, if I add other crosses, do not be afflicted.” I promised, and He left me. This Friday I suffered even more, because I had to do some chores and at every moment I thought I would die. Indeed, my aunt had commanded me to fetch water: I felt so exhausted I thought the thorns went into my brain (but this was all my imagination), and a drop of blood began to appear at my temple. I hurriedly cleaned up so she barely noticed it. She asked me if maybe I had fallen and cut my head; I told her that I had scratched myself with the chain from the well. Then I went to the nuns, it was 10:00am and I stayed with them until about 5:00pm. Then I returned home, but Jesus already had removed the crown. "Remember, my daughter, that whoever truly loves Jesus speaks little and bears everything. I order you, on behalf of Jesus, not to give your opinion unless you are asked; never to hold to your own wishes, but to submit immediately. Obey promptly your confessor and others he designates, without an­swering back; when it is necessary, make only one reply, and be sincere with your confessor and with others. When you have committed some fault of omission, accuse yourself in­stantly, without waiting to be asked. Finally, remember to guard your eyes, and think, eyes that have been mortified will see the beauty of Heaven." After saying these things he blessed me and said I should go to com­munion. I went right away; it was the first time in nearly a month that Jesus had made himself felt. I told him all of what was happening and he kept me with him a long while, because I received communion at 8:30am and when I returned to my senses it was much later. I ran home and on the way the clock struck I0:I5am. I was good and found myself in the same position that I had been in during com­munion, and as I got up I saw that my guardian angel was above my head with his wings spread. He accompanied me home himself and warned me not to pray during the day, not until nightfall, because I could not be safe. In fact I realized that I was safe from the others in the household, but not from my sister, because she had stuffed the keyhole and it was impossible to lock myself in; then my aunts intervened and in the evening I could close the door. Toward evening, I went to the Fifteen Saturdays at St Maria Bianca [the parish church of the Giannini family]; the Blessed Virgin told me She would not be paying me her usual little visit because in the past few days I had dis­gusted Jesus. I said to Her that Jesus had forgiven me, but She said: "I don't forgive my daughters so easily; I absolutely want you to become perfect: we'll see if Saturday I can come and bring Brother Gabriel." Nevertheless, She blessed me and I resigned myself. But I do not lack for temptation; one, a strong one, was Saturday eve­ning: the devil came and said to me: "Good, good girl! Sure, go and write everything: don't you know that everything you write is my work and if you are discovered, think about the scandal! Where will you go to hide? I pass you off as a saint, but you are deluded." I felt so badly that out of desperation I swore that when Mrs. Cecilia re­turned I would destroy what I had written. In the meantime I tried to tear this writing up but I couldn't; I didn't have the strength, or else I just don't know what happened. to collect myself; my guardian Angel, however, does not leave me: he gives me strength, and I must say that Sunday I had no appetite but he himself or­dered me to eat, as he did today also. Every evening he did not fail to bless me, but also to punish me and yell at me. longer have any hope; I expect to spend the night free and alone. But Jesus came, you know! How He reproached me because I had not gone to Communion. This is how Jesus reproached me: "Why, oh daughter, am I so often deprived of your visits? You know how much I yearn for you to come to me when you are good." I fell on my knees in front of Jesus and in tears I said: "But how can this be, my Jesus, aren't you tired of putting up with me and all my coldness?" "Daughter," he answered, "see to it that from now on not a day goes by without your coming to me, try to keep your heart pure and adorned with every possible care. Drive all self-love away from your heart and anything else that is not entirely mine, and then come to me without fear." He blessed me, along with all the members of the Sacro Collegio; and went away; indeed, in the end he advised me to have a little more strength in combating the enemy, telling me to take no account of those words be­cause the devil is always a liar who seeks every means to make me fall, espe­cially about obedience. "Obey, my daughter," he repeated, "obey instantly and cheerfully, and to achieve victory in this beautiful virtue, pray to my Mother who loves you so much." I would have wanted to tell him that yes­terday his Mother didn't wish to come, but He disappeared. with my conscience; I lingered until 9:00am, thinking if I should go or not; then Jesus won and I went to Communion, but how? With what coldness! I was completely unable to feel Jesus. only by myself, no one else saw me: I cried so, so much, because my sister Angelina did not want to leave my room. Yesterday evening, Sunday, for spite, she stayed in my room until 11:00pm, making fun of me, saying that she wanted to see me go in ecstasy; today again the same thing. She wrote a letter yes­terday to Bagni di S. Giuliano and spoke a lot about me and my experi­ences. These things, which I should be accepting happily and with thanks to Jesus, instead upset me, and I almost have moments of despair. "Why are you so upset, my daughter? You have to suffer something, you know, for Jesus." (In truth, what displeased me most were certain words that my sister had said out loud to me), and to this my angel responded: "You are worthy only to be scorned because you have offended Jesus." Then he calmed me, sat at my side, and said gently, very gently: "Oh daughter, don't you know that you must conform in every way to the life of Jesus? He suffered so much for you, don't you know that you must on every occasion suffer for him? Furthermore, why do you give this displeasure to Jesus, of neglecting to meditate on his Passion every day?" It was true: I re­called that I did a meditation on the Passion only on Fridays and Thursdays. "You must do it every day, remember that." Finally he said to me: "Be brave, be brave! This world is not a place for rest: rest will come after death; for now you must suffer, and suffer all things, to save some soul from eter­nal death." I begged him urgently to ask my Mother to come to me a little, because I had so many things to tell Her, and he said yes. But this evening She did not come. We are at Tuesday; I run to Communion but in what a state! I promised Jesus to be good and to change my life; I said it, but He didn't answer anything; I also asked that He send his Mother, and also mine, and he responded: "Are you worthy?" I was ashamed, and I said nothing more. Then he added: "Be good and soon She will come with Brother Gabriel." It's been since Sunday that I have been unable to collect myself; none­theless I thanked Jesus. When my guardian angel comes, I am awake, and my head does not take off; Jesus, my Mom and sometimes Brother Gabriel make my head take off; but I always stay where I am; I always find myself in the same place, it's just that my head departs. What a great need I have for my Mother! If Jesus would grant me this, afterward I would be better. How am I supposed to go so long without Mom? time my guardian angel would say something to me, but I was always awake; in fact, Wednesday evening, interiorly I thought I might be deceived by the devil; my guardian angel calmed me by saying: "Obedience." Now coming to Thursday. As usual out of obedience I went to bed; I be­gan my prayers and immediately collected myself. For a while I had been feeling ill. I stayed all alone; when I was suffering Jesus wasn't there and I suffered only in my head. My confessor asked me this morning if I had had the signs, and I said no. They hurt a lot but not compared to my head. Poor Jesus! He made me stay alone for about an hour but then He came and showed up like this, all bloodied, saying: "I am the Jesus of Father Ger­mano." I did not believe him, and you know why. (Gemma is referring the the Devil –editor) I am always fearful, always. I pronounced these words: "Long live Jesus and Mary" and then I under­stood. He gave me a bit of strength but internally I was still afraid, and he said: "Do not fear: I am the Jesus of Father Germano." 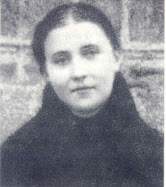 (Gemma had not yet met Father Germano, although Jesus had shown him to her in a vision and told her that he would someday be her spiritual director -editor) He urged me of His own free will, without my even suggesting it, to pray for Mother Maria Teresa of the Infant Jesus because she is in Purgatory and suffering greatly. Jesus wants her quickly with him, I think. Today I slept a little, then I felt completely collected; after becoming collected I felt my head take off: I was with Jesus. How happy I was! Yes, I suf­fered so much in my head; I complained a little because He is leaving me alone. I begged Him also to tell me when Mother Maria Teresa would be in Heaven. He said: "Not yet; she's still suffering." I commended my poor sin­ner to Him and He blessed me and all the members of the Sacro Collegio and He left me in a happy state. This evening I felt I could not collect myself; I said a few evening prayers and went to bed. To tell the truth, I foresaw a bit of a storm because Jesus had warned me a few days ago, saying: "The enemy will try you with one final battle, but it will be the last because now that is enough." I could not help but thank Him for the strength He had always given me, and I prayed that He would want to give me strength for this final test as well, that is to say last night. I went to bed, as you know well, with the intention of sleeping; slumber was not long in coming when almost instantly a tiny, tiny man appeared, all covered in black hair. What a fright! He put his hands on my bed and I thought he wanted to hit me: "No, no," he said, "I am not able to hit you, don't be afraid," and as he said this he lay down on the bed. I called Jesus to help me but he did not come, but this doesn't mean he abandoned me. As soon as I called his name I felt liberated, but it was sudden. Other times I had called Jesus but He had never been ready like last night. You should have seen the demon afterward, how angry! He rolled around on the floor, cursing; he made one last effort to take away the cross I had with me but then he instantly fell backward. How good Jesus was with me last night. The devil, after that last effort, turned toward me and said that since he had not been able to do anything, he wished to torment me the rest of the night. "No," I told him; I called my guardian angel, who opened his wings and alighted next to me; he blessed me and the bad devil ran away. Jesus be thanked. This morning I learned that at the very moment the devil was rising in fury, the scapular of Our Lady of Sorrows had been placed on me [by Ce­cilia Giannini] and I realized that when the devil was trying to take some­thing off of me, it could be nothing but that. My Mother, Our Lady of Sor­rows, also be thanked. Here I am at Saturday: it's the day destined for me to see my Mom, but should I hope for it? Finally evening has arrived. I set out to recite the Sorrowful Mysteries of the Rosary; at first I abandoned myself, that is to say, I placed myself in God's will, to spend that Saturday also without seeing Our Lady of Sorrows; but for Jesus this offering was enough of a sacrifice and he fulfilled my wishes. 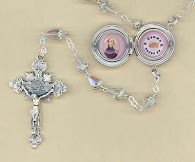 At some point, I'm not sure where in the rosary, I felt completely collected and with this collection, as usual, quickly my head took off, and without re­alizing it, I found myself (it seemed to me) in front of Our Lady of Sorrows. 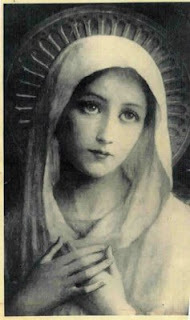 Upon first seeing her, I was a little afraid; I did all I could to assure my­self that it was truly Jesus' Mother and She gave me every sign to assure me. After a few moments I felt entirely happy but I was so moved by seeing my­self, so little compared to her, and so content, that I could not say a word except to repeat the name “Mom”. She stared, really stared, at me, laughing, and approached to caress me, and She said I should calm down. Yes, of course, happiness and emotion grew in me, and She, maybe fearing that it would be bad for me (as happened other times, indeed one time, which I did not tell about, when for the great consolation I felt in seeing Jesus again, my heart started beating with such force that I was obliged, on the orders of my confessor, to tie a tight, tight bandage around that point) left me, saying that I should go and rest. I obeyed promptly, and in one second I was in bed and She did not delay her coming; then I was calm. I also must say that upon first seeing these things, these figures (that certainly could have been deceptions), I am initially taken with fear; then fear is followed quickly by joy. However that may be, this is what happens to me. I spoke with Her about some of my desires, the most important one being that she should bring me with her to Heaven; this I said to her several times. She answered: "Daughter, you must suffer still more." "I will suffer up there," I wanted to say, "in Heaven." "Oh no," was her reply, "in Heaven there is no more suffering; but I will bring you there very soon," She said. I feared that She would leave me at any moment and so I called her repeatedly and said She should take me with her. Her presence made me for­get about my protector, Brother Gabriel. I asked about him, why hadn't She brought him along, and She said: "Because Brother Gabriel demands more exact obedience from you." She had something to tell me for Father Ger­mano; to these last words She did not answer. 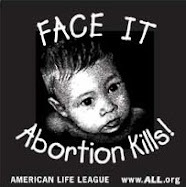 "My daughter, that's enough; Jesus wants this sacrifice from you, now it's time for Me to leave you." Her words calmed me and I answered with tran­quility: "So be it, the sacrifice is done." She left. Who could describe pre­cisely how beautiful, how beloved is the Heavenly Mother? No, for certain there is no comparison. When will I have the good fortune of seeing Her again? 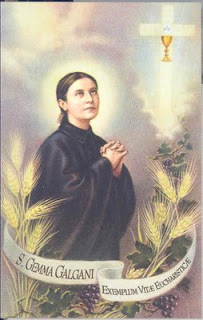 I love St.Gemma Thank you for this BLOG!!!!!!!!!! I share the same birthdate as her MARCH 12!!! I feel a connection her, she is quite inspiring. I love reading about her and her diary...if only we could imitate her way of life. Sometimes its hard..but I think that if practiced a little self denial we would be on our way. To read holy and ediffing things is very benificial to the soul. Thanks for your kind comments. I am relly glad to hear that you are enjoying this blog. 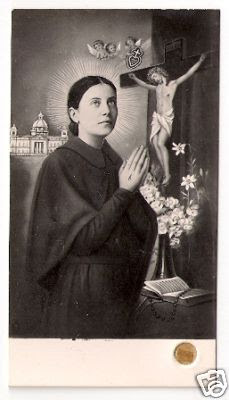 I pray that St Gemma may always be very close to you and may she lead you ever closer to her beloved Jesus. What a good saint! She was on such familiar terms with Jesus, Mary and the saints! Dear Gemma, Please Pray for this sinner also. Dear Glenn , Thank you for your hard work in making Gemma known. May the good Lord bless you for your charity. Where can I read her entire autobiography? My birthrate is march 12 as well!